Lata Mangeshkar the sole of Indian cinema has started her career in early 1940s. Lata Mangeshkar has sung song in more than 36 languages but her primary languages are Hindi and Marathi. Lata Mangeshkar was born in 28 September 1929. Lata Mangeshkar has sung hundred thousands of songs. 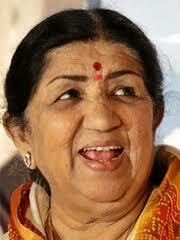 Lata Mangeshkar is also known as nightingale of india and some people also called her Didi. Lata Mangeshkar has started her career in 1942. After the seven decades she is still a star who is on the top. Lata Mangeshkar made a record which was also enrolled in the Guinness book of world record. She sung over 25,000 songs between the time periods of 1948 to 1974. Lata Mangeshkar has sung all types of Song in her career like sad, romantic, duet, solo, patriotic etc. She gives the huge contribution for Indian cinema. Here we are providing you the lyrics of All Songs of Lata Mangeshkar in there Hindi Translation as well. We hope you will like them.